I don't really see any relief, particularly in new construction. They can pull it away from the wall, out beyond the depth of the switch gear and be compliant. The wording is from the floor to 6 feet above the equipment or up to some type of structural ceiling. We had a similar situation with tons of foreign piping above the gear in a job in downstate Illinois and they installed a concrete slab below the gear and the piping. 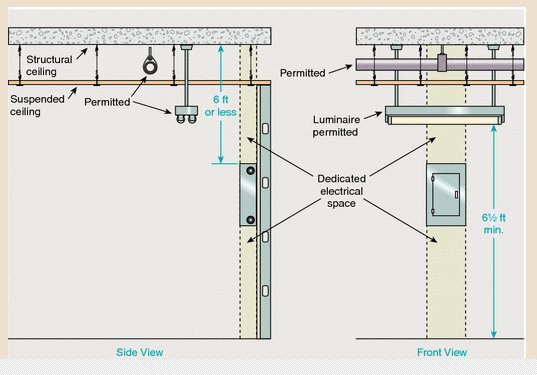 The AHJ said that a suspended ceiling or drywall wasn't acceptable, but he would accept something "that you could walk on". BTW, be glad that you're not in Chicago, where the space isn't just above the equipment, but also above the working space. Who made that call? The electrical AHJ, or the Building AHJ? The Electrical AHJ. The job is a union job. It's a major mistake on the builders part. It's in the actual text of the Chicago Electrical Code. "Dedicated Electrical Space. The space equal to the width and depth including working space of the equipment and extending from the floor to the structural ceiling shall be dedicated to the electrical installation. No piping, ducts, or equipment foreign to the electrical installation shall be located in this zone." I have seen a job where the only place to put some piping was directly over the service panel. The only way around it was to install a drip pan to prevent and condensation from dripping on electrical panels. You had to 90-4 that if it was in the 6 foot dedicated space. There is no code language to support the variance. Yet ... in the same building where they just can't keep stuff out of the electric room .... ever notice how the room for the elevator equipment is kept clear? No HVAC, no file boxes, and even the maintenance guy hasn't set up a desk in there. I wonder why that is ... could the annual inspection have something to do with it? Along the same lines ... if the offending pipe is part of the fire sprinklers, NEC is overridden by the sprinkler code. Likewise, there are limits as to how much a plumber can move a drain.